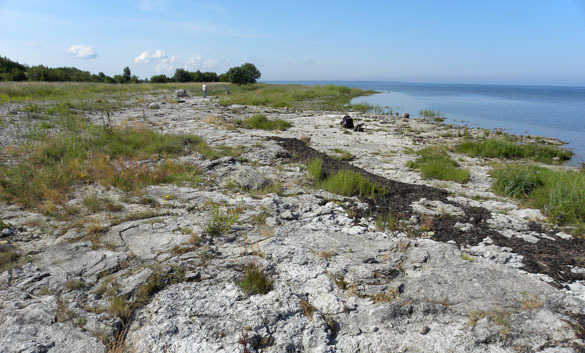 KURESSAARE, ESTONIA–Today our Wooster Geology team visited a favorite outcrop of mine: the Äigu Beds of the Kaugatuma Formation exposed on the northwestern shore of the Sõrve Peninsula on Saaremaa. These are Late Silurian (Pridoli) limestones with a great abundance of crinoid fragments — so many that they are locally called “ringstones” (see the above image of a crinoid stem and isolated ring-like columnals). Palmer Shonk (’10) studied this outcrop for his Independent Study thesis. We returned here today to collect more field data so that Palmer, Olev Vinn, Bill Ausich and I can write a professional paper on the depositional system and paleoecology. The limestones show significant storm beds made of skeletal debris, especially the crinoids but also corals, stromatoporoids, bryozoans, brachiopods and trilobites. 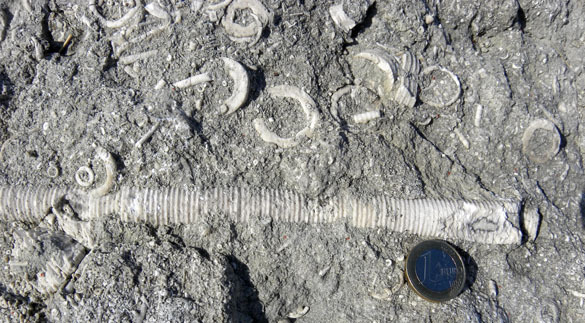 The most remarkable aspect of this exposure is the presence of an in situ crinoid “forest” of holdfasts (the part of the crinoid that holds it to the sediment). Our job today was to find out more about the non-crinoid fauna since Palmer and I have already mapped out the crinoid holdfasts. 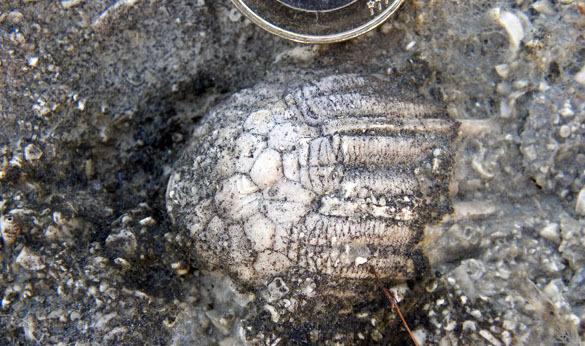 We hope to soon publish a rare look at a Silurian crinoid community essentially preserved in place. The Kaugatuma outcrop on the Sõrve Peninsula of Saaremaa. This was a Russian amphibious landing zone in 1944. You can bet you’ll read more about that story later! 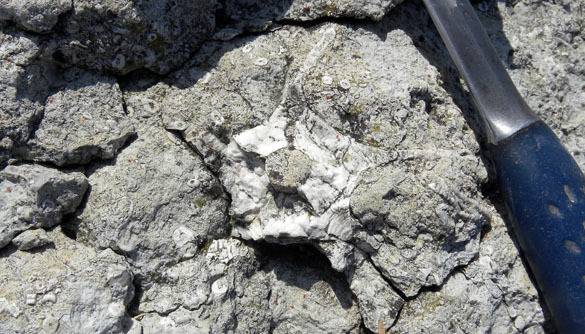 The star-shaped fossil with the hole in the center is a crinoid holdfast in place at Kaugatuma. There are dozens of these scattered across the outcrop. The crinoid is Enallocrinus. The hole in the center is the hollow lumen of the crinoid stem. Nick found this calyx of another crinoid known as Eucalyptocrinites. Such well preserved calices are rare. 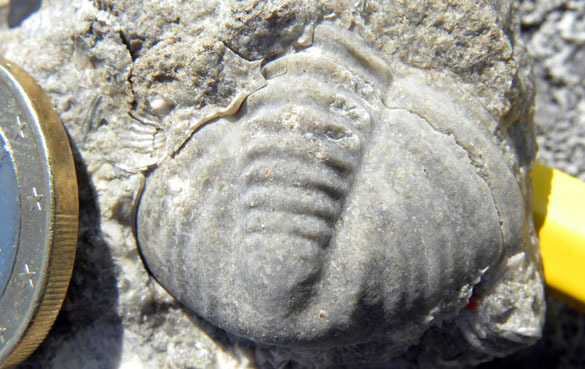 Nick also found this very nice trilobite pygidium (tail piece). It is preserved well enough that we can probably later identify it to the genus level.